Arrive at Ulaanbaatar. Meet your Guide at the airport and transfer to the hotel. We will star city tour the first stop is Sukhbaatar Square, the central square named after the revolutionary hero of 1921 Damdiny Sukhbaatar who declared independence from China. We visit Gandan Monastery the largest and most famous functioning monastery in Mongolia; here we may experience monks in worship and see the impressive Golden Buddha Statue of Migjid Janraisig. Time permitting Natural History Museum which is famous for its authentic dinosaur skeletons and visit Zaisan memorial hill to view of whole city from there. Welcome dinner at restaurant and stay overnight in hotel. Today we will drive to Khongorinn Els sand dunes, the largest sand dunes in Mongolia. 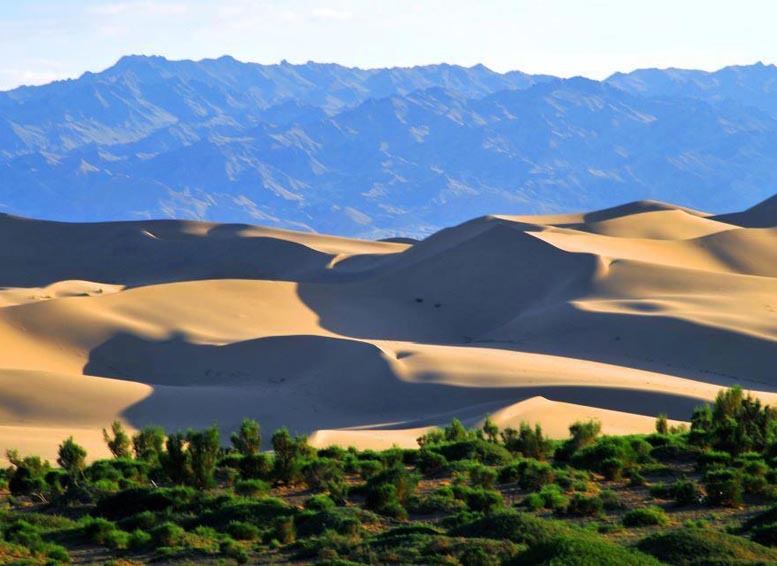 These dunes lie in the Gobi Gurvan Saikhan National Park. The drive is through some incredible desert scenery with flat, stony plains; outcrops of vegetation; hills of interesting rock formations; and herds of wild antelope racing across the plains. The roads are flat and fairly even so it will take at least 4 hours. The shifting sand blown by the wind or someone makes sound so it is called Singing Sand Dunes. Stay overnight in ger at tourist camp. Today we will have a full day exploring the sand dunes and rest after the long drive. The dunes seem to stretch on forever like a soft ribbon of sand draped over the desert. The shifting sand blown by the wind or someone makes sound so it is called Singing Sand Dunes. 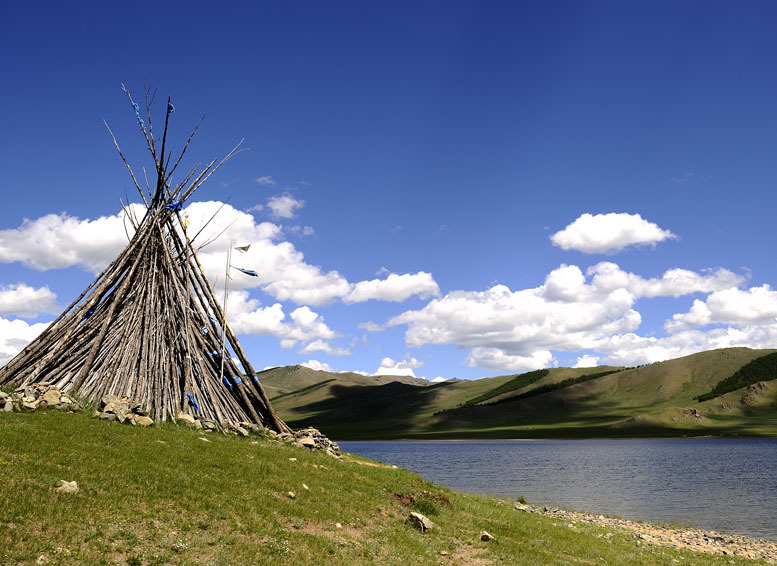 There is a beautiful green oasis known as Seruun bulag near the Khongor River. 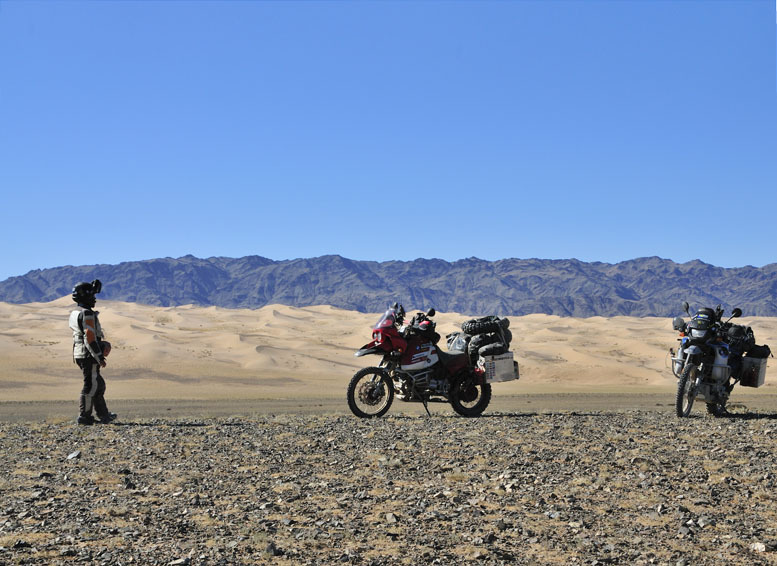 Return to the camp for lunch and enjoy feeling silence and a peaceful in the beautiful surroundings Gobi Deserts. Dinner and stay overnight in ger at tourist camp. 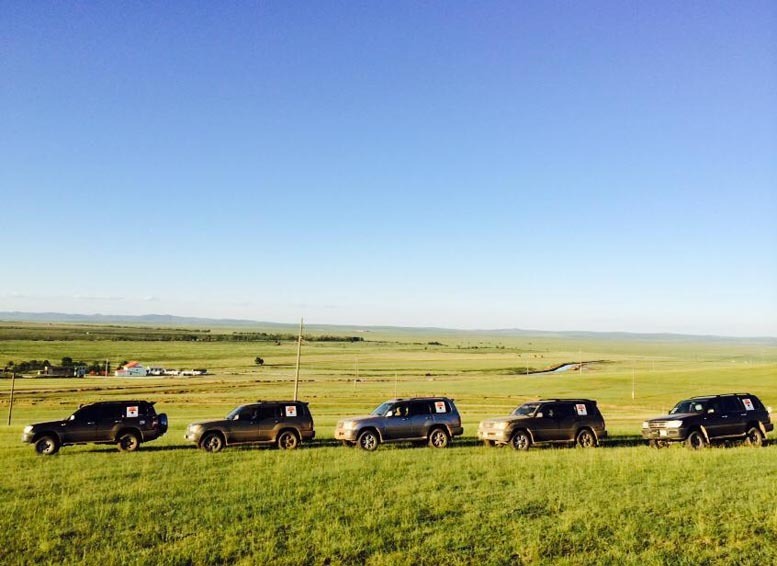 Drive to Bayanzag which is located 20 kilometers far from Bulgan soum, where 70 million years ago a lot of Paleontological findings have been discovered. The place is known as Flaming Cliffs so named by Roy Chapman Andrews American explorer who had visited Mongolia in 1922. During two years he searched through the Mongolian Gobi Desert and he found dinosaur fossils and dinosaur eggs about 10-15 cm from the Bayanzag for the first time in the world. Visiting and exploring native land of dinosaurs and taking some photos for beautiful surroundings. Dinner and stay overnight in ger at tourist camp. Drive to Ongi temple. The ruins of Ongi Temple are found in Saikhan Ovoo soum of Dundgobi (Middle Gobi) province. It used to be a big Buddhist monastery compound built by Bari Yonzon Khamba at the bank of Ongi River. Transfer to the camp before the lunch. Visit the ruins of temple also there is small ger museum signifies ancient things. Dinner and stay overnight in ger at tourist camp. Early morning drive to Karakorum and arrive late afternoon, on the way picnic. Ancient capital of Mongolia Karakorum city was located on the right bank of Orkhon River and on the north-eastern slopes of the Khangai Mountain and founded by Chinggis khan in 1220, was not only the capital of the vast Mongolian Empire but the epicentre of trade along the Silk Road. At that time the inhabitants of city were mostly Merchants craftsmen who came to karakorum from all over the world. Khubilai khan moved to the capital of the Mongolian Empire to China, establishing the Yuan Dynasty, began losing its importance. In 1379 much of the city was badly damaged during an attack by the army of the Min Dynasty. Stay overnight in ger at tourist camp. In the morning drive to Ugii Lake. On the way we will be visiting two monuments of Turkish and about 60 kilometers from the imperial town of Karakorin. There are two important monoliths located near another one. The first monument is dedicated to the Turkish prince Kul-Tegin (638-731), and the other to his brother Bilge-Khan (716-734). In the afternoon take some rest and short hiking by lakeshore. Stay overnight in ger at tourist camp. Drive to Hustai National Park Hustai National Park is the site of a unique re-introduction scheme of Przewalskii’s horse (Equus przewalskii), called "takhi" by Mongolians. It became extinct in the wild in 1969 and, since 1992, has been successfully re-introduced to Hustai from zoos around the world. This has been an international effort monitored by The Foundation for the Przewalskii Horse, based in the Netherlands and MACNE (Mongolian Association for Conservation of Nature and the Environment). The national park is rolling Steppe Mountains with rather large patches of birch and aspen forests. There are also visible remains of Neolithic graves. In addition, red deer (Cervus elaphus) and wolf (Canis lupus) have increased quite a bit during the last few years, as well as Mongolian gazelle. Species present in Hustai but usually not seen include Lynx, Argali Sheep and Roe Deer. 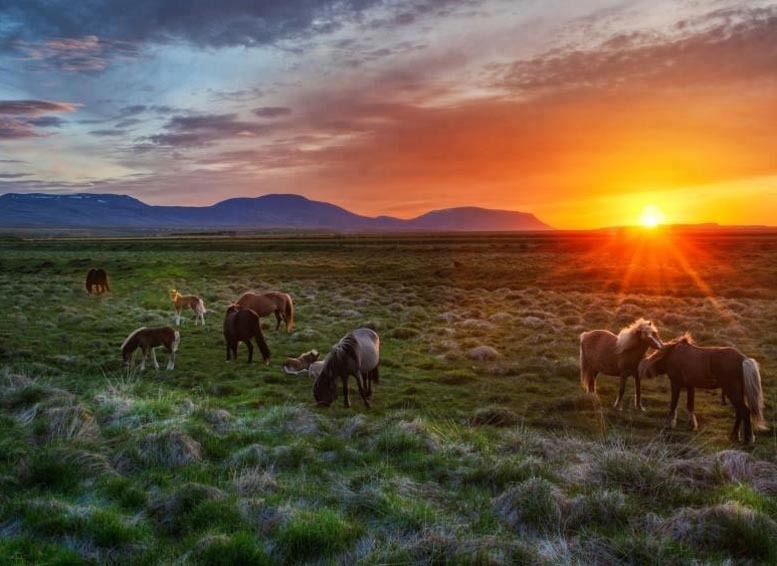 The Hustai National Park in Mongolia is world famous for the successful reintroduction of the Prezwalski horse. Stay overnight in ger at tourist camp. Drive back to Ulaanbaatar. Transfer to the hotel and lunch at local restaurant in Ulaanbaatar. In the afternoon free time do shopping for cashmere shop, souvenir shop and State Department Store. Enjoy watch national folklore performance by “Tumen Ekh” national song, throat singing, tsam mask dance and so on. A farewell dinner and stay overnight in hotel.